I f you’d been alive in England at any time between the first and tenth centuries AD, you would have had quite a few worries on your mind. It would have made no difference whether you were rich or poor, ruler or peasant. If you were a king, you’d never know which of your brothers, half-brothers or nephews was going to stab you in the night and claim your title; and as a humble farmer, if famine or plague didn’t get you, then warfare probably would. The term ‘Dark Ages’ has always conjured in my mind a time of upheaval, invasion and barbarity; in AD 410, when the last of the Roman legions departed our shores to deal with troubles closer to home, it’s as if the last one to leave put all the lights out. This was a time before England’s identity had taken root, when even the concept of English-ness was unknown and unrecognised by its inhabitants. The Celtic tribes, some of whom had assimilated the lifestyle of the Romans, found their wealth and security ebbing away; and on the next tide came a fresh wave of conflict, in the shape of the Anglo-Saxons. Michael Wood is a well known historian and presenter whose knowledge always leaves me in awe. His journey through the Dark Ages begins with one of history’s most enigmatic characters. “It is the story of the bitterest war ever fought in Britain; a desperate colonial war which saw the destruction of the largest Roman towns… the deaths of 70,000 colonists and untold numbers of Britons. Enter Boadicea, flame-haired widow of Prasutagus, whose outrage at the treatment of her people knew no boundary and no fear. Riding at the head of her army, she blazed her way through the Romano-British settlements of Colchester, Chelmsford and St Albans; and before the legions could turn back from their engagements further north, she had razed the prosperous city of London to the ground. From here, Wood leads us through the turbulent years of Anglo-Saxon invasion, briefly examining the evidence for the Arthurian legends and describing the possible circumstances behind the richly endowed ship burial at Sutton Hoo. With him, we visit the magnificent palace of ‘Good King Offa’ at Tamworth, and learn why the country was left so much stronger after the death of this ‘great warrior’; and we realise that, far from chiding Alfred for burning some cakes, we should, in fact, be honouring him for saving the last few acres of England from the bloodthirsty grasp of the Vikings. Woven into the thread of England’s fortunes are the kingdoms of Scotland, Wales, Cornwall and Northumbria; of these, it seems that the kings of Northumbria were the thorniest and most enduring problem. Eric Bloodaxe, whose roots lay in Norway, presided over a Northumbrian population that was described was “treacherous, stubborn, violent and rebellious”, ready to throw in their lot with any leader who offered them independence from southern rule. Offa, Alfred, Athelstan, Edgar… all great kings, brutal by modern standards but feared and honoured beyond the shores of England. Through their far-sighted wisdom, commitment and courage, the country and its people prospered. Wherever there is a temptation for wry comment or criticism, Wood steps nimbly around the pitfalls while still managing to maintain our interest. His passion for the characters, the places and the landscape never wavers; he sits just on the informal side of academic, his story-telling enthusiastic but unbiased, with a talent for painting scenes so vivid that I found myself reading them twice, just for pleasure. The only aspect of his writing that I find disconcerting is an occasional tendency to flash forwards and then backwards in a character’s life or reign, especially if their death was a pivotal event; this, in a period of history that is rife with similar-sounding names like Aethelwulf, Aethelbald, Aethelberht and Athelstan (‘athel’, in Middle English, means ‘noble’), certainly stops your attention from drifting off. Surprising, shocking, moving, inspiring… ‘In Search of the Dark Ages’ is all of these. Wood transports you expertly from the tradesmen’s shops of Roman London to the marshes of Athelney, where Alfred made his heroic stand; and from Athelstan’s court at Dorchester to the prosperous Viking quarter of tenth-century York. Educational and enjoyable… all history books should be like this! Sounds very intriguing, I’ll have to check this out. Wonderful! It’s on Hank’s booklist…such a fascinating time and place. How marvelous it is to live now though, he rather suspects. As he relaxes on his velvet couch. As he gets a belly rub. As he rests secure in the knowledge that the biscuit supply (and other delicacies) are mere moments away. Sigh. Hank, how right you are! Although a few centuries later, I’m pretty sure you would have fitted right in to the court of Louis XIV in the Palace of Versailles! Well, that’s just what Hank’s psychic says! Definitely worth a read, Lynne! It makes me want to see all those Anglo-Saxon palaces and courts, but sadly none of them seem to have survived. I confess I don’t know much about the Dark Ages, but they’ve always sounded sinister to me. It sounds as if it was a big job writing a book like this (all those similar sounding names would be bamboozling enough), but from your review it seems to have been worth the effort. 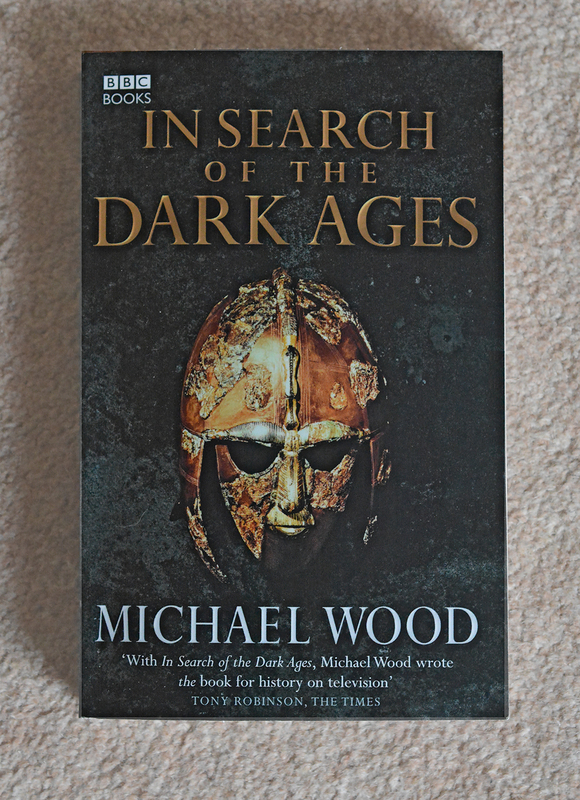 I’ve always been a bit hazy about that particular period, and any book on the subject is surely a challenge – but Michael Wood specialises in the Anglo-Saxon era, and he certainly knows his Aethelwulf from his Aethelstan! This isn’t a recent release, although it was new to me, and I can totally recommend it. Anny, you’re so right! I don’t think it’s just you! 🙂 Now I am going to have to find out where I can teach myself Old English, too! You are lucky to have a first edition copy. How strange that the hardback was the same price in 1981! I don’t even think it’s available now in hardback, which is a shame. Now this is my favourite period in English history. I shall have to add this lovely tome to my library someday. Thanks for a resounding review!!! You’re very welcome, and I am glad you are inspired to read the book! I would love to go back in time and see the landscape and the ‘burhs’ as they were then. Love this time in history and am always watching documentaries or reading books. Fascinating review. Thank you, Carmen. I am fascinated by this period, too – more so because so there’s still so much mystery. The Sutton Hoo treasure, for one thing, is just so beautiful and so tantalising.